That will put me only 14 years away from retirement and 25 years from when we were first promised a GO train in Clarington. But hey, at least the folks in Kirby will get their train long before we do. I wouldn't necessarily count on catching that train in 2024. Look how many of those projects are in some variation of "design" or "planning" or "procurement" vs. actually under construction. How many of the projects that aren't under construction yet are going to get cancelled by an incoming provincial government next year after the election and never get built? Well, you can't expect a professional government corporation to be TOO expedient, can you? This is the problem. Nobody knows what the conservatives have in mind, good, bad, or otherwise, because a year out, they still haven't unveiled a platform. 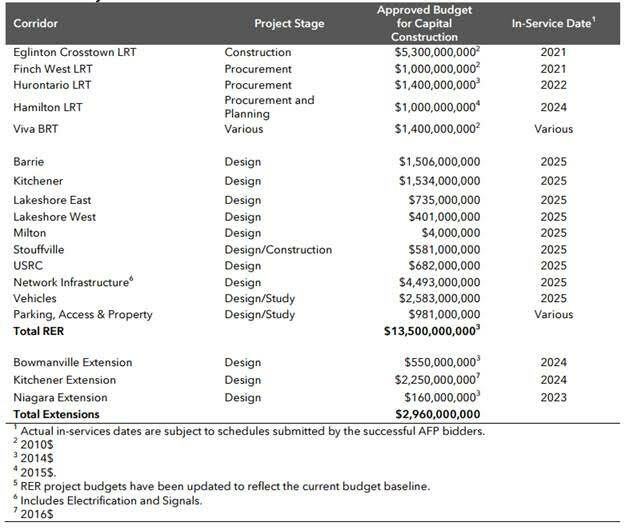 I remember dealing with the severe public transportation cutbacks that happened during the Harris/Eves era and don't want to revisit that but in the absence of a platform saying what they are going to do, how does anybody know any of these projects will proceed? How do we know any of the projects underway, even under construction, but not sufficiently advanced won't be cancelled and contract cancellation penalties paid out on top of money already spent to make it go away? After seeing the Eglinton subway tunnel started and then filled in and the TTC and Go service cuts from the same time period and seeing Rob Ford cut an ~$80 million cheque to make a few LRT lines disappear more recently, how do we trust there won't be more of the same?